What is Cosmetic Foot Surgery? Cosmetic foot surgery is a group of aesthetic surgeries, which are performed to rectify structural problems, eliminate functional pain, or improve visual appearance of feet to a great extent. These are painless procedures in most cases and are carried out as per the requirements of the patient. There is no clear difference between cosmetic and non-cosmetic foot surgery as a deformed foot not only causes pain or discomfort but it often looks unattractive too. Hence, the need of cosmetic foot surgery is a common matter of debate. In fact, there are lots of people as well as surgeons who consider it as a reconstructive procedure that can make life better by eradicating ache and uneasiness. Foot Facelift – Helps style up the feet by making them narrower and aesthetically pleasing. Cosmetic Bunion Surgery – Discards painful bumps (bunions) from the top or edge of the big toe joint. 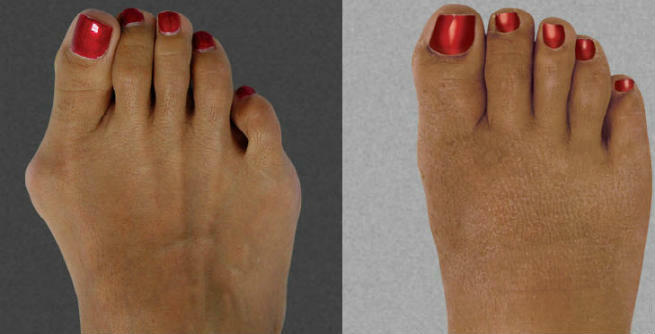 Cosmetic Tailor’s Bunion Surgery – Eliminates throbbing bumps formed at the back the pinkie toe. Cosmetic Hammertoe Surgery – Correct problems like aching contracted toes and ugly corns by leaving less visible scars. Cosmetic Toe-shortening Surgery – Makes the second toe shorter and slimmer so that stylish shoes can be worn. Cosmetic Nail Surgery – Removes tender ingrown as well as fungal toenails that make styling of feet easier. The procedures vary widely depending upon the types of surgery. However, there are certain points that are common between all of them and those are what make them different from conventional foot surgeries. Incisions are planned in a very careful manner and plastic-made surgical closures are used to close them completely. Scars need to be least visible in cosmetic procedures and hence, special suture materials are used for keeping the tissue reactivity as low as possible. The entire procedure may take anywhere between 30 minutes and 3 hours depending upon the type of procedure. Those who want to get rid of structural foot problems, make their feet look prettier, want to get right fit for their shoes, and so on should consider themselves as ideal candidates for cosmetic foot surgeries. However, it is advised that you stay away from such procedures if you are not having any pain or discomfort in your feet and just wish to change their shape. There is no need to stay in the hospital for more than 48 hours. But, you have to wait at least 6 to 8 weeks to return to your normal activities. Some common risks and side effects of cosmetic foot surgeries include infection, anesthetic reaction, swelling, bruising, bleeding, incorrect surgical results, chance of reoccurrence, etc. Corrects foot deformities and removes pain caused by them. Makes it easy to style up your feet in a variety of shoes. Gives a better fit to your shoes. Turns your feet into aesthetically pleasing ones. The cost of cosmetic foot surgery may range between $2,500 and $6,000 for every single foot.